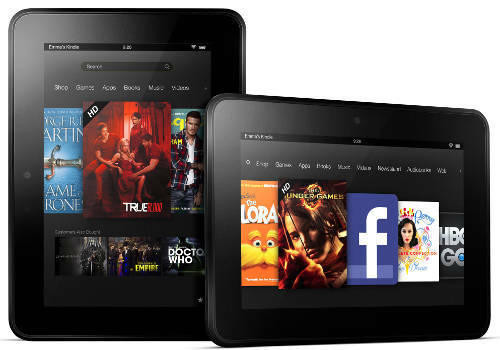 Amazon has just issued a series of firmware updates for their latest line of Kindle Fire Tablets, including both the 7-inch and 8.9-inch HD models as well as the 2nd generation Kindle Fire (the one that sells for $159). The update adds some new features. The 7-inch Kindles now support X-Ray for Textbooks (the 8.9″ Kindle HD already had it), which provides additional information about the most important terms and concepts in a textbook, complete with glossary definitions and links to pages. I recently reviewed X-Ray for Kindle ebooks and it can be an extremely useful feature, and I imagine it could be very helpful for textbooks as well. Another useful feature that was added in this round of updates is the “Time to Read” option found on the Kindle Paperwhite that analyzes your reading speed and then calculates how long it will take you to finish the current chapter as well as the remainder of the book. The time left is shown in the lower left corner and can be set to show the time remaining in the chapter, the book, or you can set it to show location instead (at least that’s how it works with the Paperwhite). Another new feature is the option to change the default language used on the Kindle Fire tablets. Some already had this, but now there are eight languages to choose from, English (U.S.), English (U.K.), German, French, Italian, Spanish, Japanese, and Chinese (Simplified). The last main new feature provides added support for Kindle ebooks with advanced formatting. The Kindle Fire tablets can now view audio and video clips embedded in Kindle ebooks. Enhancements for Print Replica Textbooks were added too. According to Amazon, you can now scroll through thumbnails at the bottom of the screen to preview pages and jump quickly between chapters, and mark important notes and highlights in your Notebook for easy reference. Like always, you can wait for your Kindle Fire to automatically download and install the update without any intervention on your part, or you can download the update now and install it manually. Geez, wasted electrons, don’t ya think? When will we get decent ability to manage our books, both on a real bookshelf and in the order WE want them? I have a Nook, Nook HD+ and the Kindle HD. The fact is that the original Nook was the easiest to use and least problematic. All the new stuff is getting nowhere fast in the areas that you see users really asking about. Will there ever be an update for you to access your wish list from the kindle store/library rather than going to the website. Hmmmmmmm?